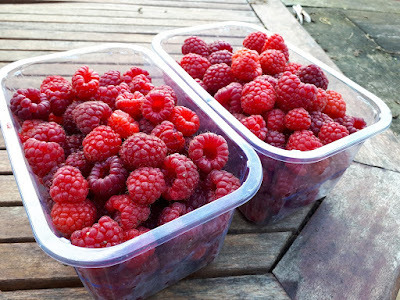 1.4kg of Organic raspberries picked from the fruit garden Friday morning. Waitrose organic raspberries are £24 per kg so that's £33.60! Although I'd probably settle for their essential British range at £12.75 per kg making this little lot worth £17.85! If I only had a small garden I'd concentrate on growing berries, tomatoes, salad leaves and courgettes I think. Heavy cropping and high value. 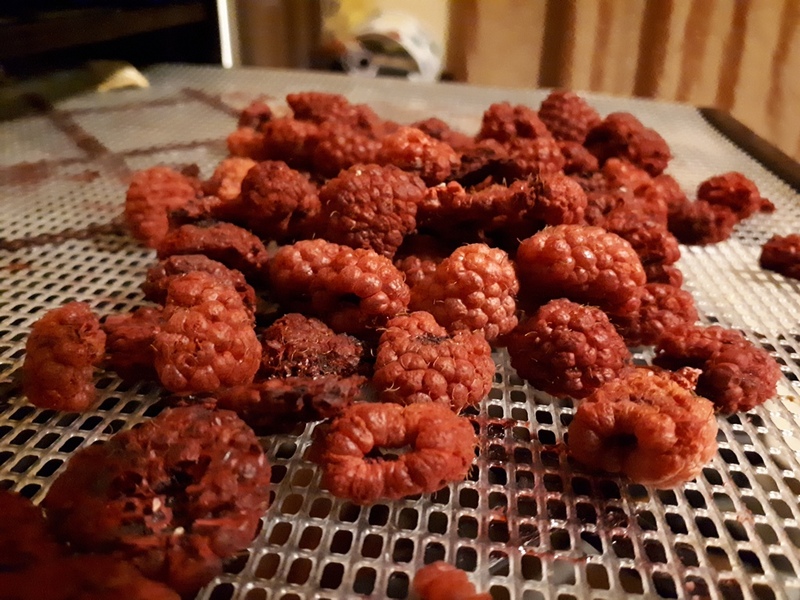 With these we ate some fresh for our lunch, then I made half a dozen jars of raspberry and apple jam (I think it works better with apple so it's not so "pippy"). And dehydrated a load to add to our breakfast, cakes and cookies. These are pretty intense if you have them straight out of the jar! Hopefully I'll pick a load more this week as well. What would you do with a glut of raspberries? Raspberries are good mixed with apple in a crumble too, although I've found dehydrated ones hard to eat as each fruit seemed like a solid lump of pips. If anyone can be bothered with the extra work of putting the fruit through a muslin bag (just leave overnight the bag hanging over a bowl from a frame made from an upturned chair! ), pip-free raspberry jelly is so much nicer to eat than plain raspberry jam. I made mine into a puree with some sugar to add to natural yoghurt. I open froze a tray ready for jellies and trifles. Sounds good! Every year my mum freezes loads of pots of damson puree to have on her porridge in the morning, enough for the whole year! I agree with your summary for a small garden, I have loads of fruit growing, they take less ground space and crop well. I will never have enough to preserve, but I can have fresh fruit. And that's where the savings are. Preserves are cheap in comparison to fresh fruit. Just a few punnets and you've normally broke even on the cost of a fruit bush. My Polka raspberries did OK this year, although I think the late frost might have hindered them just very slightly. 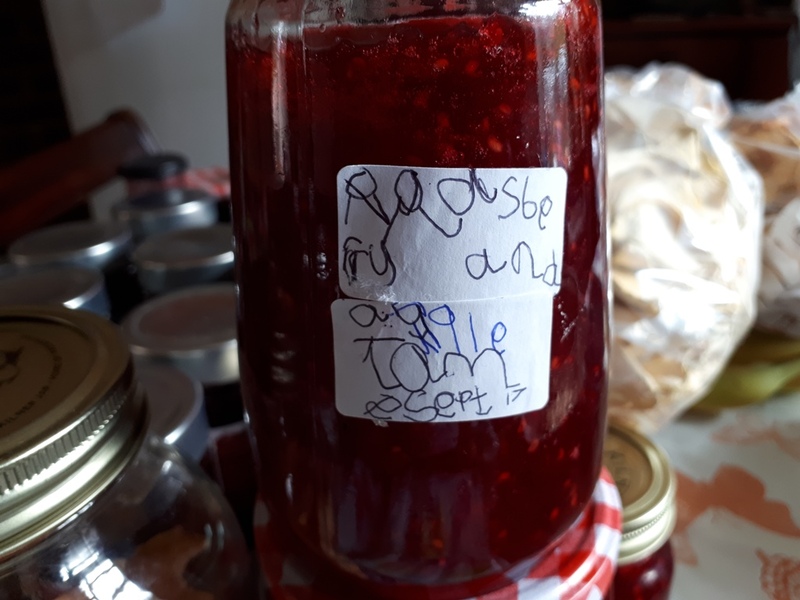 My 1 year old daughter has been enjoying freshly picked raspberries – raspberry and apple jam sounds delicious and definitely one to try for us. Hi Lucy, I used to read your blog years ago, not even sure why I haven't been by lately! My kids love fresh raspberries, my youngest daughter had a friend round today and ran her straight down to the raspberries so they could fill their faces! They're the same with blackberries as well! You won't regret making raspberry and apple jam, a taste of autumn in the dead of winter is always welcome! I grow Tayberries, which are much the same but bigger. I made quite a lot of jam this year which is sensational. Sugar, fruit, and a splash of lemon juice.